Offset Light Mount | Arson Machine Co.
Our Offset Light Mount is a no holds barred exercise in utility driven modularity. 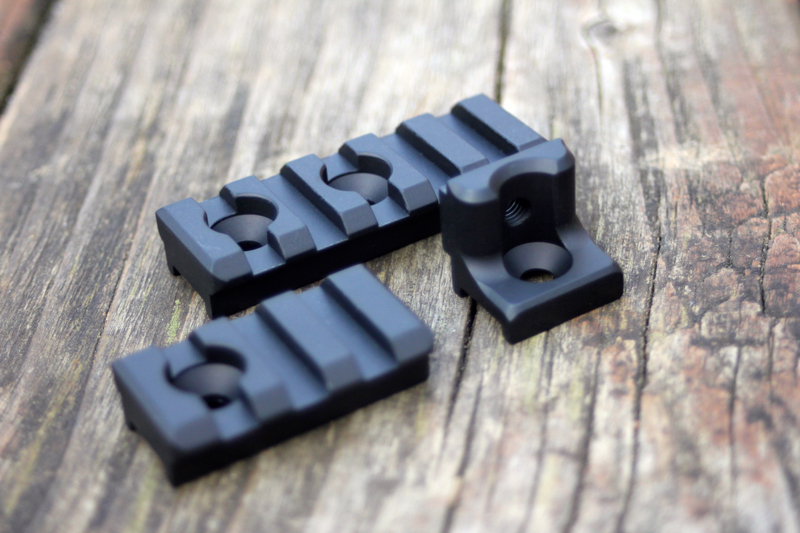 We spent many napless days refining the design to maximize functionality and strength whilst minimizing the over all footprint of the mount system on your Keymod or M-LOK equipped rail system. The adapters incorporate the same mounting interface as all of our bases except offset at 90° to the 3 or 9 o’clock positions. They are fully ambidextrous and can be run with the accessory rail above or below the base. Why 90°and not 45° you may ask? In developing this mount we found it to be more comfortable to actuate the light as well as it places the light closer to the centerline of the host rail system. 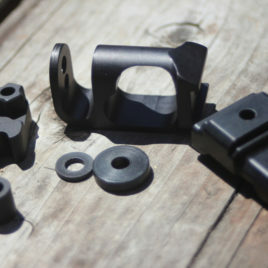 We offer 2 rail lengths for our Offset Light Mount. The first is a 3 slot 1913/Picatinny rail that is 1.4″ long with one mounting hole. 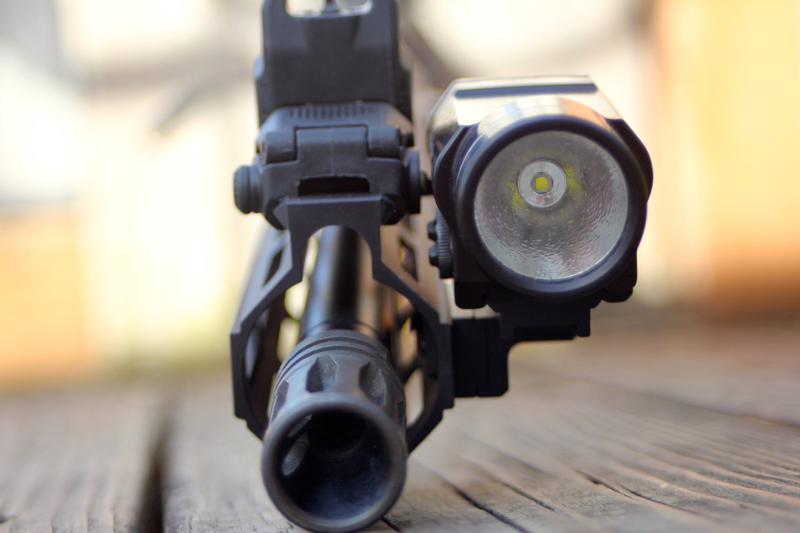 This rail section was primarily designed to be use with a standard pistol light such as the SureFire X300 series lights or the Streamlight TLR series lights. It will still work with the Inforce WML lights, but rail contact isn’t as ideal as the 5 slot rail. 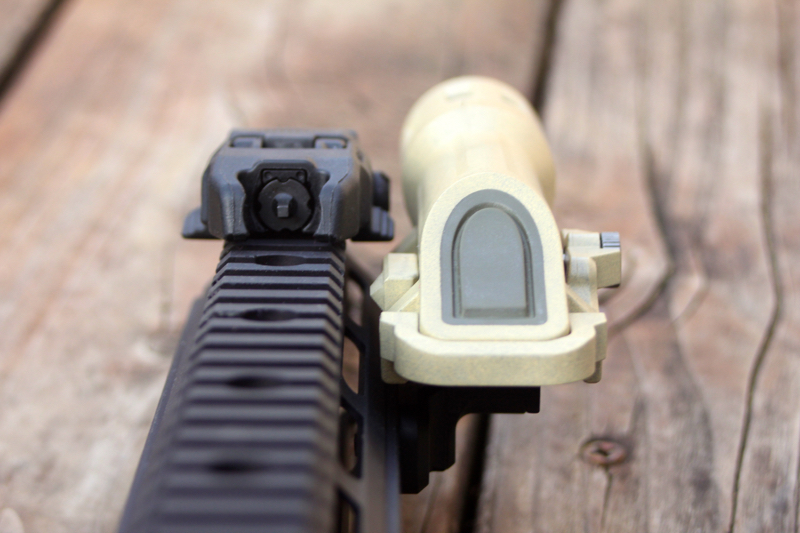 If light weight or low profile is a priority, the shorter rail is the rail option for you. The second rail we offer with this mount is a 5 slot 1913/Picatinny rail that is 2.2″ long with two mount hole options for more mounting flexibility. It was designed to allow the light to be cantilevered further forward if so desired as well as for use with the Inforce WML lights giving maximum rail to light contact. 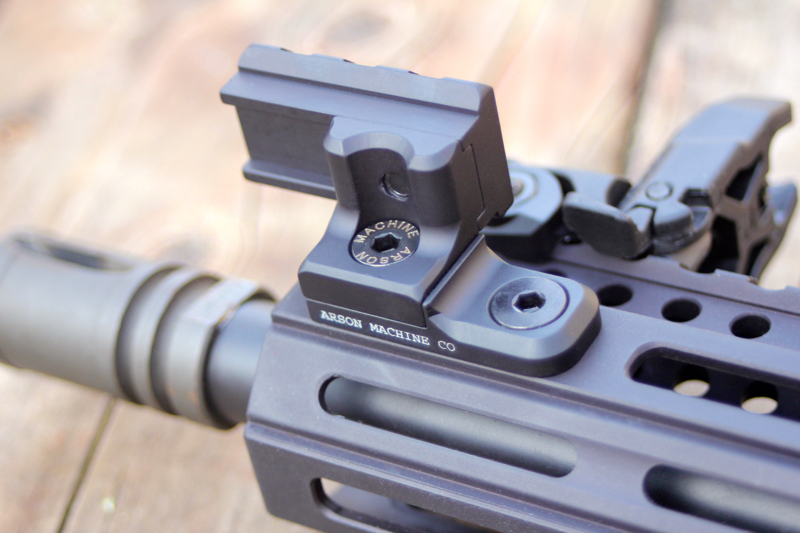 The rails can be run cantilevered to the front of the weapon or to the rear and the 5 slot rail also has a center mount hole to further expand mounting placement to help with clearance issues. Our Offset Light Mount rails utilize the same mounting system as all of our other light mounts, so they can even attach directly to our bases further expanding utilization options. As with all of our parts these are made from 6061-T6 domestically produced aluminum, they are Type III hardcoat anodized black, and all hardware is blackened stainless steel. 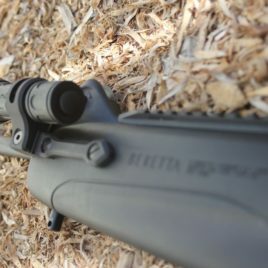 Fitment issues: Given the the goal of getting the light as uncomfortably close to the centerline of the handguard as possible, some interference issues can arise. 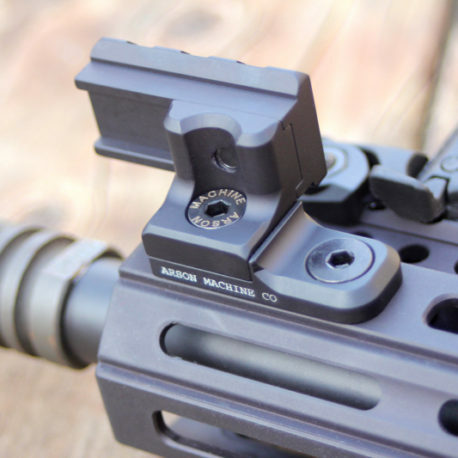 While our Offset Light Mount will clear many front sites, we have seen some issues with Magpul MBUS front sights. This mainly involves the light clearing the sight release tabs that stick out to the sides. In some instances one could modify the front sight (grinding down or removing the tab(s) on the MBUS) or the light itself (in the case of the Inforce WML it would be removing the safety bar from the rear of the light). 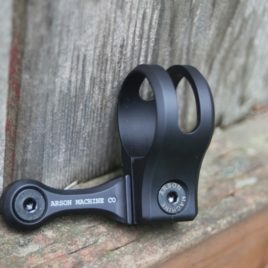 But ultimately we designed our Offset Light Mount to allow for many placement options to help alleviate this issue. In most cases the light will be extremely close to the sight, but not inhibit it’s function. 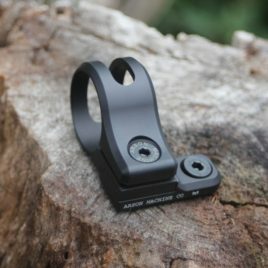 Furthermore our Offset Light Mount is not compatible with the Troy TRX/Alpha Forends or the Magpul MOE (M-LOK or MOE slot style) due to interference issues. If you have questions about this, drop us a line to info@arsonmachine.com . In a world of fixed camera shooting videos, one company stands above the rest in it's quest for dynamic shooting footage. Armed with only determination, a CNC mill and more grit than their sandblasting cabinet, Arson Machine's™ quest for the perfect tactical selfie led them on the journey of a lifetime. In their webstore now is: The GoPro Gun Mount. Buy it today and share the adventure.